February, 2010 | MDC - Marketing. Design. Creative. We hope you’re enjoying the Olympic Winter Games. Leave us a comment at the bottom of this post about where you’re from and how you’re enjoying the games! 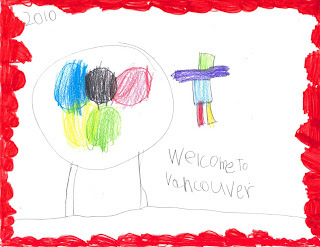 Click here to learn more about the artwork created for your postcard (by Alex in Grade 1), which was part of BC’s Student Welcome Card Program. Here’s some other Olympic photos for your enjoyment. The opportunity to capture great images abound in Vancouver, and right now, the city is brimming with them! Check out some of the buzz, cool images and public art that was happening downtown just one week prior to the Olympic Games, before all the people arrived! Click for a link to the full gallery. Enjoy the Games! We will be! As a Creative Services company, our everyday goal is to inspire with beautiful artwork, unique design and creative messages. And with just a week until the “Big Event”, we’ve given way to some Olympic spirit and been inspired ourselves by artwork created by our Province’s children. As a way for schools to get involved in showcasing their 2010 Winter Olympic Games spirit and engage in fun activities that celebrate this once-in-a-lifetime event, students from schools across BC were invited to submit original art with the theme Dream, Discover and celebrate your British Columbia. This B.C. Government program, called “The Student Welcome Cards” program, showcases students’ art as unique cards, in an online gallery, and on posters and displays in the Olympic Villages. 70,000 cards were printed and are ready to be given to the athletes and other team members. Each card comes with an image and a bilingual message welcoming the card recipient to B.C. and wishing them well during the Games. Of course we were most proud of our own little Grade One artist (image above). Student art can be viewed here, by school name. Enjoy and share to show your Olympic spirit!